oCam v382.0 - Main product oCam of OhSoft is a powerful video recording program that can record video to be played on the monitor via your PC. For long time, many people in the world have used this solution so this has been optimized. This solution can record effectively many internet video including online game using a variety of formats by unlimited length advantages. Additionally, You can use GIF recording function and WEB-CAM recording function in this solution. Avira Anti-Virus is detecting oCam(Deep Screen) as a false positive, do not worry. 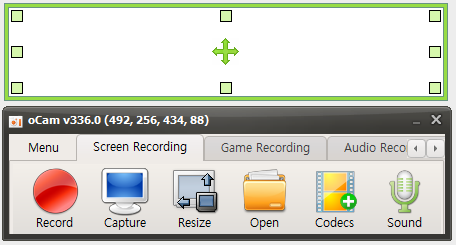 Computer screen, game, video, audio recording is possible. Recording using the built-in video codecs(AVI, GIF, MP4, MKV, NVIDIA NVENC H.264, M4V, FLAC, FLV, MOV, WMV, TS, VOB). Recording using the built-in audio codecs(MP3, AAC, FLAC) and real-time audio encoding. Can record you use the external VFW codec. Recording schedule function is available. Fixed a bug where the Desktop Duplication API did not work on some PCs. On some PCs, Fixed a bug where recording failed with message "The audio engine (shared mode) or audio endpoint device (exclusive mode) does not support the specified format."